When this blog post was live on my website An Italophile, it was the most popular post that people were reading. I guess people are interested in how children celebrate birthdays in other countries. It was one of the reasons why I wanted to write the post in the first place. When we first moved to England my children were invited to quite a few birthday parties, as they were in year 6 and year 7. The one thing that struck me at the time was the fact that none of these parties were held at home. This made me reminisce about the Italian birthday parties that my children went to during our time spent in Italy, where quite a few of them took place at people’s houses. Most of those that weren’t held at home occurred at a local pizzeria. I thought back in particular to a friend of my husband and his kids. We always went to celebrations at their house (including New Year’s Eve). Birthday parties were large events. They have a large family so there were always grandparents, aunts and uncles plus lots of cousins. Even if the birthday party was for their daughter, all of their son’s closest friends and their parents and siblings were invited too. I remembered that one of my husband’s friends made the comment that all the relatives are all the same, they behave in the same way, year after year. And the father of the birthday girl said, thank goodness for that, that things never change. The food can be amazing. At every event there was quite a spread. The wife of my husband’s friend loves cooking as well, and she excelled at trying new recipes too. As for food in general you find potato chips, lollies sometimes, always soft drinks. One of the highlights for me and many of the adults were homemade bread rolls that resembled the shape of a donut, with a hole in the middle. They had pieces of pancetta in them with pecorino cheese and were really nice. Then there were sandwiches, lots of small rolls with ham in them, pastry with frankfurters, torta salata with tuna. 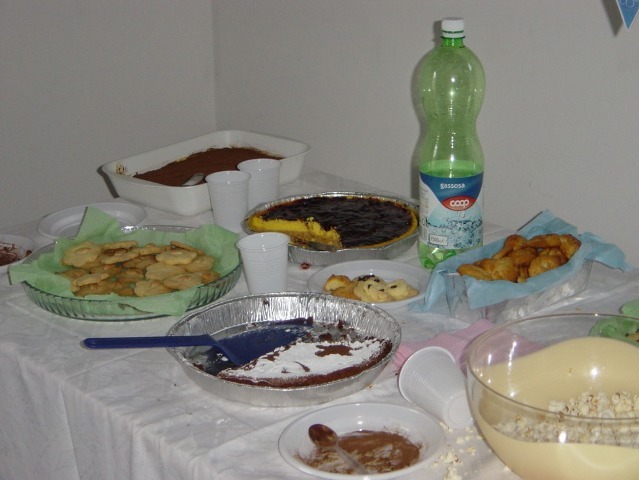 Let’s not forget the sweet things, shop bought cakes (small patisserie things filled with cream), small rolls with Nutella in them, small cup cakes (unusual for an Italian party – they even had hundreds and thousands on top), a crostata. Plus American style chocolate chip cookies, which the mother pointed out, were not an Italian recipe. She had added salt to the recipe which came as an odd surprise. But it is not the first time that I have seen an inventive recipe tried at a birthday party. Once I had a discussion on cheesecakes at the gym. And then lo and behold at the next birthday party a cheesecake appeared. And it was delicious. The biscuit base as usual, the cheese layer which was yellow and you could taste the egg and on top, with jam spread on top. The cheesecake is in the picture below (in the back next to the gassosa bottle). Afterwards I thought that I tend to make things that I am comfortable with. And I haven’t really been very investigative with my cooking. Making local things such as pesche (peaches). 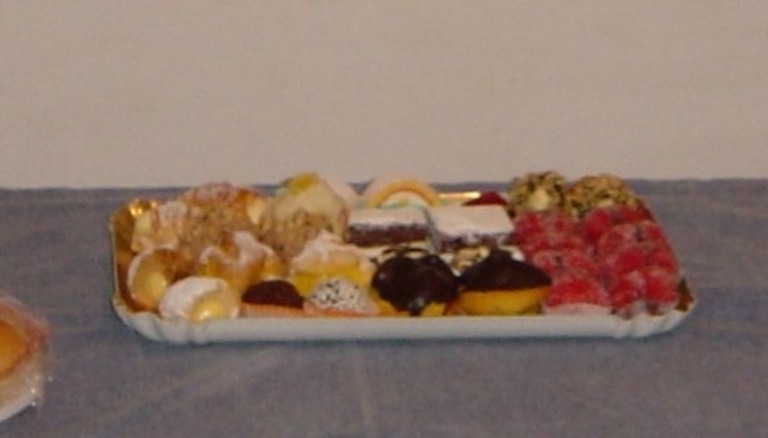 There are some pesche below, they are the pink ones, with the chocolate in the centre. One of the mothers commented that pesche made in Capodimonte (her home town), are slightly differently to those made in Tuscania and in fact more like peaches, as they put in a hazelnut, to resemble the stone that is in peaches. This dolce is still on my to-do list. These friends are lucky enough to have a piece of land, on the outskirts of town with a small stone building, where they have their birthday parties. But other people do not have large plots of land so they pick other alternatives. Some people chose one of the halls attached to a church, there is one within the walls of the historic centre of Tuscania and in the modern part. Or people have chosen to have a party at a pizzeria and there are many to choose from. 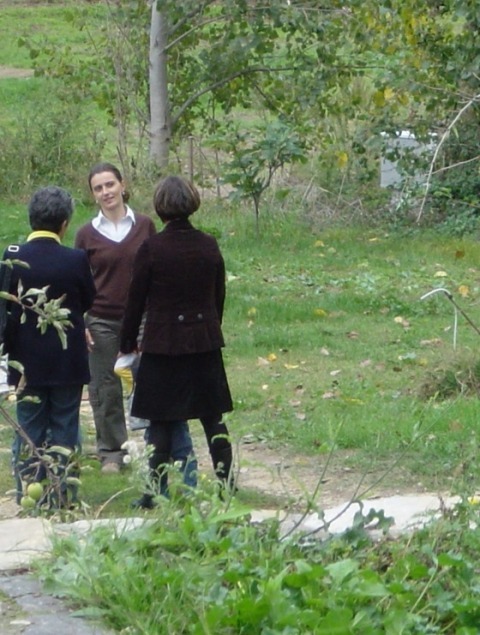 A couple of parents have also hired out a room at the Arte et Agricoltura Agriturismo, which is located about 5 kilometres from the centre of Tuscania. What is necessary at parties is outside space for the children to run around, as generally speaking no games are ever planned. 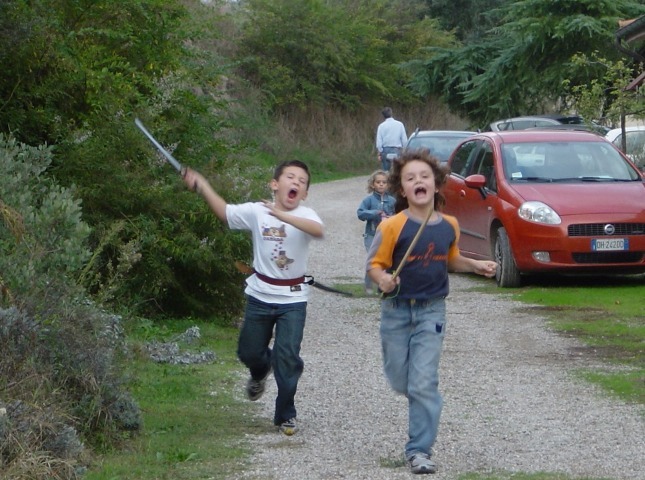 I have only been to two parties, held by Italian parents where games have been organised. Generally the kids eat only a bit and then go off and play whatever game they make up. The parents of the child whose birthday it is will often pass by and encourage you to go and eat. In the past I’ve often waited until other mothers have approached the table full of goodies before heading there myself. If pizza is on offer, adults will gravitate towards it, because it is so tasty, absolutely melt in your mouth. Some people, such as one of my son’s classmates, has a wood burning oven on site at their piece of land. Perhaps it is a strange thing, to describe it as this, a person’s piece of land. 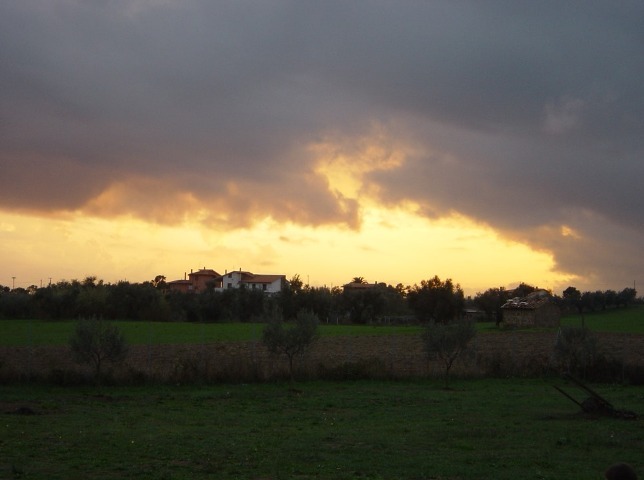 But when we lived in Tuscania, a town that has a rural/ farming background, and there are people who live in town, but then they have a piece of land, where they have their olive trees, vines sometimes, fruit trees and a vegetable patch. At this birthday party, the kids even got to have a ride on a horse, if they wanted to. In my mind the people are the same, but the food on offer is changing, at least by some Italian mothers who are inventive and open to trying recipes that are different. 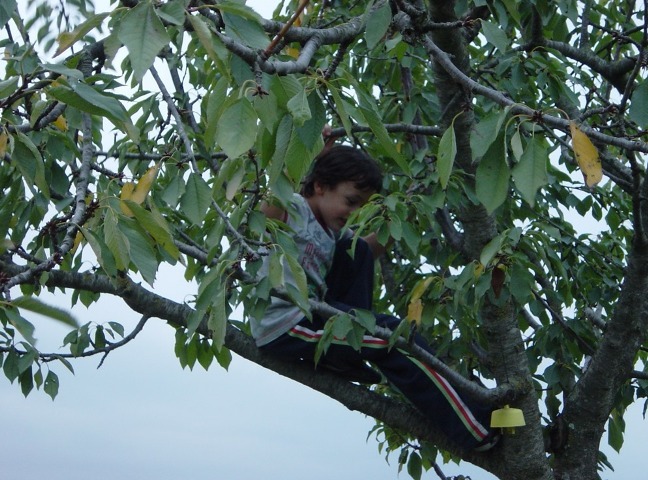 This entry was posted in Expat and tagged living in Italy by Cathy Powell. Bookmark the permalink.